If you own a charging dock like TwelveSouth’s HiRise 2, an upgrade from the original HiRise charging dock for iPhone and iPad, you can now use it to charge your new AirPods as well. 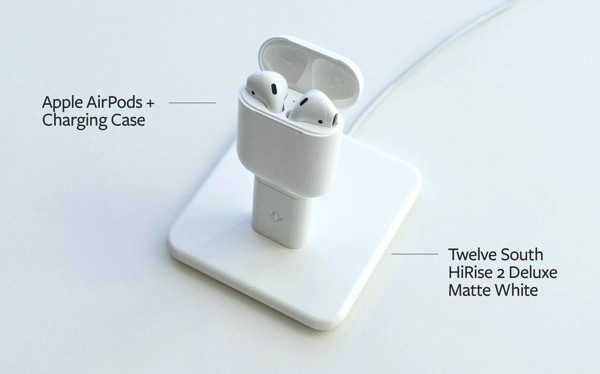 The HiRise 2 can charge your AirPods just like any other Lightning connected device, as shown in the image below. To charge your AirPods simply remove the back support post and pop the charging case right on top. For those who aren’t familiar with HiRise, it is a beautiful little stand for hands-free use of your iPhone or iPad, while keeping all your Lightning connected devices fully charged. Simply perch your iPhone atop the stand to raise your screen to a more comfortable height for FaceTime or Skype calls. For more information about TwelveSouth’s HiRise 2, visit this link.